The Cosmic Background Imager was put into service in 2000 at Llano de Chajnantor, a high plateau in the Atacama Desert of northern Chile. It was the result of collaboration between the United States, Canada and Chile. 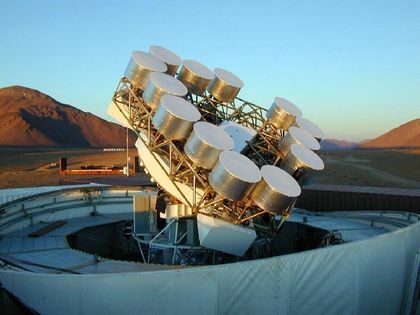 The Canadian Institute for Theoretical Astrophysics is responsible for Canada’s participation in the observatory. The goal of the Imager is to make a map of the distribution of cosmic background radiation, microwave radiation that represents the aftermath of the Big Bang, the great explosion that gave birth to the Universe. The cosmic background radiation being mapped by the Imager was produced only 400,000 years after the Big Bang when the Universe first became transparent and luminous. The Imager is thus studying the oldest light energy ever emitted. Mapping the distribution of this ancient light – this ancient radiation – effectively allows researchers to “see” what the Universe looked like very shortly after its birth. This information is extremely important because it helps them better understand the creation, organization and evolution of large structures in the cosmos, such as galaxy clusters. The observatory’s telescope operates at wavelengths between 0.83 and 1.15 centimetres, which corresponds to the field of microwaves. It consists of 13 parabolic antennas mounted on a platform measuring six metres in diameter that can be pointed anywhere in the sky. Each antenna is 90 centimetres across and is lodged in a protective cylinder sealed with a Teflon cover that can transmit microwaves. In 2002, the telescope detected a pattern in the distribution of background cosmic radiation that revealed structures much smaller than any observed to date. Researchers also detected a second pattern that could provide new information about the movement of matter shortly after the Big Bang. In 2006, original antennas were replaced by 140 centimetres antennas, offering greater resolution. Observations made by the Cosmic Background Imager have continued until June 2008.